This plate is missing Fairy Gingerbread...not to worry though. Crisp and scalloped cookies will be served up tomorrow. I received an pressing e-mail from Liz Jones and felt it had to be answered first. 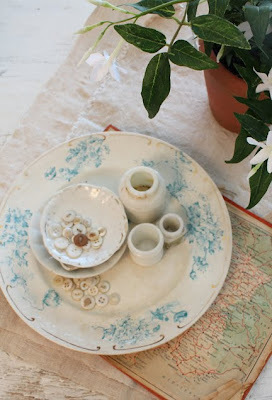 She writes: "How do you use chenille trim? It looks narrow......"
Liz, I should have explained it in more detail on the original blog posting. Above is the chenille trim dyed by R & R Reproductions. It comes in four wonderful colors. Barb and I have been purchasing the white trim and dyeing it with tan Rit dye. We've used the same formula over and over. Not very exciting or interesting. We asked Ann and Pat from R & R if they might shake things up a bit for us. They came to market with these five wonderful colors. Fudge, Cocoa, Smoke, Cinnamon and Kelp. Cinnamon and Kelp are calling my name. I can hardly wait to use them. It might take a bit of time, but all of your cross stitch shops should have this product soon! Here are some pictures that give you an idea of how we use chenille. The picture above shows one of the best uses of chenille trim. It hides any gap between a wooden or paper mache box lid and the stitched piece. The picture also shows chenille trim before it is dyed. It comes flat and white. Doesn't look much like the trim we use on projects, does it? Wet the trim, dry it and it fluffs up like a new born chick. 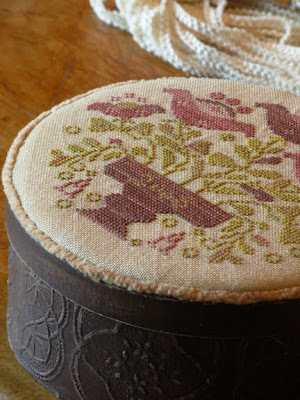 Click on the word chenille trim in the sentence above and the link will take you to a tutorial I made a couple of years ago on dyeing trim. Another great use of the trim is shown above. The trim is laid on top of the seam line and your sewing thread is stitched over it to couch it in place. 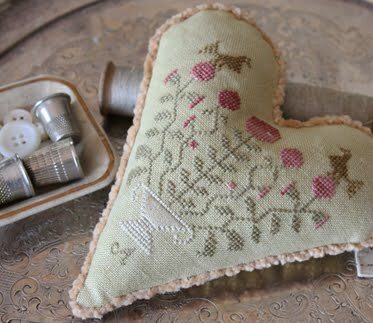 The chenille trim frames the heart pincushion. Wish the lovely green or red shade of chenille had been available to trim the heart....would have been much more dramatic. The fairies will be busy this afternoon. Will show you the gingerbread tomorrow. Love the chenille trim. I've dyed it and used it many times since viewing your tutorial...and I have a lovely box like yours from the SB Retreat! Such fun times and such fun projects! I really ♥ your new stitch book! I'm hoping I'll find some of that trim at my LNS at some point. I always love how you use the stuff! Where can you purchase the r and r chenille trim??? I searched some major cross stitch sites, and they do not offer it. Thanks for the update post. I wondered where you get the natural color. I never thought you just dyed it in the kitchen. :)I will be checking out your tutorial and asking at my local store. Thank-you for the pictures I was lucky enough to take a class from you both in Mn. last spring. I fell in love with the chenille trim. The new coloirs are exciting. Thanks for the photos and info. I always like how the chenille looks on your projects, but was never really moved to try it before. Now I will. Love, love, love A Stitcher's Journey! Love the chenille, will definitely need some.....soon.! The chenille trim looks so yummy! I just finished the basket quilt from an older post, love how it turned out. Thank you so much for you wonderful blog. 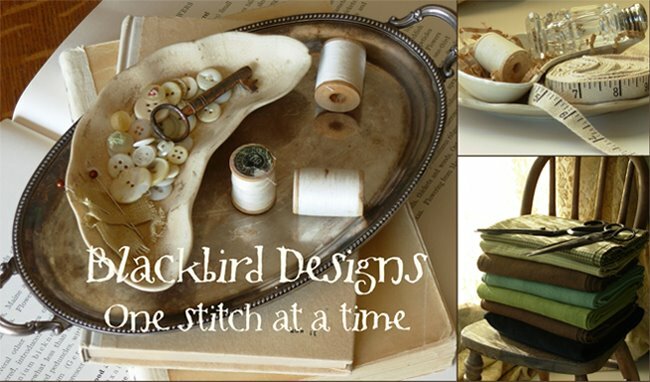 Blackbird Designs have enhanced my life. 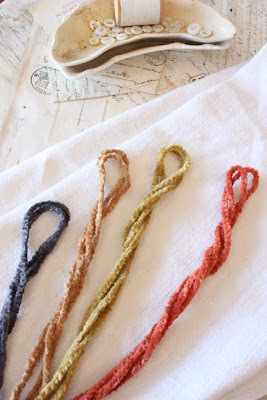 I love this chenille trim and can't wait to get some and try it out. I need to find out if the trim is available in the UK - I need some! Never heard of Fairy Gingerbread so I'm looking forward to the next post. The colours of the trim are just delicious - must try some and it gives such a lovely finished look to your projects - inspiring!!! Love your patterns, I now have too many to count! Do you know where I could purchase the round box you have shown? Do you sell any of the round stitcheries ? Looking for someone to purchase from . Your goodies are beautiful !